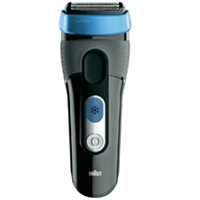 Braun CoolTec shaver enables you to experience a cool shave which protects very well the skin of those who have a sensitive complexion. 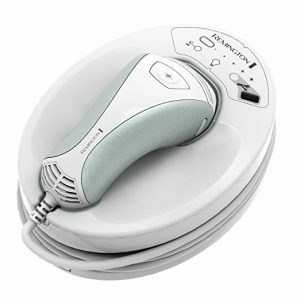 Braun CoolTec electric shavers differ from the other devices of the German producer by being destined to dry shaving, which means that you will not have to use any type of cream or gel. 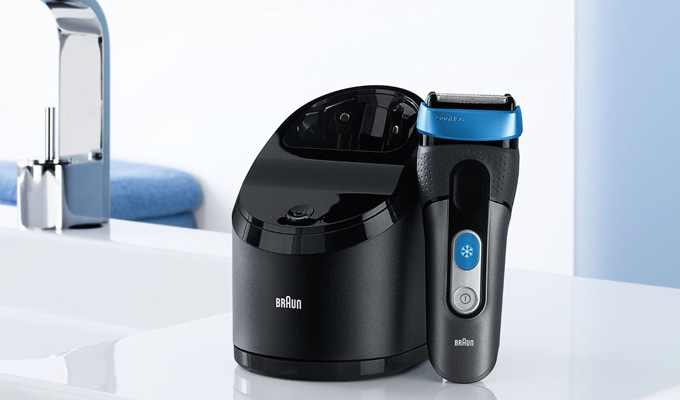 Braun confidently places this range in the top of the most performant dry shavers in the world and if we take into account the positive criticism that these devices have received from their consumers, we can say that this is not far from the truth. The most important aspect that makes CoolTec stand out from the other Braun ranges is its ability of eliminating heat during shaving, fact that offers a cool sensation to the skin of the user. This range presents the world’s first shavers that have the “active cooling” technology, the key element being the innovative thermo-electrical Braun technology. This means that, while the entire amount of heat is produced in the head for other shavers, CoolTec is equipped with an innovative blade which actively cools down the skin during shaving. If you have a sensitive skin, you might want to know that this thing reduces to the minimum the sensation of redness, of irritation, of burning or itchiness over your face, offering instead freshness and vigor to the skin. The active cooling technology mentioned above is created by the German producer with the aid of an incorporated cooling electro-ceramic element which enables the cooling of the skin even during shaving. This thing works without any gel, creme or other lotion that you are, most probably, using at present. We can therefore consider the fact that the users get the chance to save up some money by using these devices as a second benefit of this technology, because they will no longer need to periodically invest in shaving lotions. The adaptable 3-cutting-stage system enables to efficiently cut the hair, adhering perfectly to the line of the face, which leads to a smooth skin in a very short time. You will never have to go across an area twice in order to make sure that there are no untouched hairs. 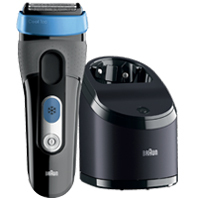 If you are worried about those hairs who tend to grow in chaotic directions, Braun CoolTec shaver can help you regarding this issue also, due to the blades specifically created to make sure that not a single hair will be missed. Their name is SensoBlade and they can be compared to the OptiBlade foil from the Braun WaterFlex range, which is used for the same purpose. The last one, though, offers a higher performance, representing the accomplishment of 50 years of experience in developing foils for Braun. Another revolutionary element that we can meet in this range is also the Clean&Charge station with triple action, a lot more upgraded than in the previous ranges. Fueled by alcohol, this station does exactly what its name says: cleans and charges the device after the shaving. It is, at the same time, the only such device in the world, having three main functions: it lubricates the devices with every cleaning, it offers a much more hygienic cleaning than the water from the tap does and it charges the device, so it can be used by the user whenever it is needed. The German producer has been working on this technology for 10 years, this being the only brand that uses a cleaning solution whose main ingredient is able to eliminate 99,999% of the germs. Braun has been testing this Cleaning Center for a few years, and the studies carried out in Germany in 2009 have shown that more than 150 users have experienced a smoother shave by using this station, while 110 consumers have confirmed that this technology provides comfort and enhanced hygiene if used regularly. Another advantage offered by Clean&Charge is the simplicity of preservation. For instance, under the usual circumstances of 2 uses per week, all you have to do is charge the cartouche of the station once in every two-three months. The things mentioned above are innovative technological features for the Braun CoolTec shaver, but the German producer has not forgotten to also add some other important aspects in order to increase the comfort and the efficiency of the devices. Therefore, we can also observe that the devices of this range are, as well, water-resistant up to a 5 m depth (as a comparison, Braun WaterFlex devices offer resistence up to 1 m depth), aspect which offers the user the possibility to wash the device completely, anytime and anywhere. An extra feature that the CoolTec has, unlike the Braun WaterFlex, is also the travel-sized pouch which offers a little extra comfort to users when it comes to transporting the device. Let’s not forget about the 2-year warranty which protects the consumer if the device happens to encounter any unpredictable issues of functioning. The CoolTec range has two available models in the USA : CT2s and CT5CC. Both models are black and they differ from one another only by some aspects regarding equipment and endowments. The most important difference between them is the fact that model CT2s does not dispose of the Clean&Charge station, which means that the cleaning and the preservation of the device have to be done manually. Thereby, Braun CT2s is accompanied by a charging support (on which you will place the device after plugging it in) and a bottle of oil for the preservation of the blades. As we have mentioned in the beginning of this text, the CoolTec range from Braun offers indeed some of the most performant devices on the market place, its main advantage being the ability of protecting sensitive skin against irritation. 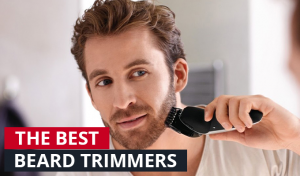 According to the opinions of the consumers who have tried one or more of these shavers, they do not disappoint even the most pretentious of us. They are ergonomic, qualitative and resistant and the technology that they incorporate offer the entire comfort that men seek for in a shaver. More than this, the devices offer a shave that is efficient and close enough to the skin in order to leave behind a smooth and silky skin, which feels extremely good due to the sensation of coolness offered by the thermo-electric cooling Braun technology. The fact that it doesn’t require the use of other additional lotions such as gel or foam (even if we are talking about wet or dry shaving) is a bonus offered by the CoolTec range, which can also be felt in your pocket, not only in the comfort offered to your skin. 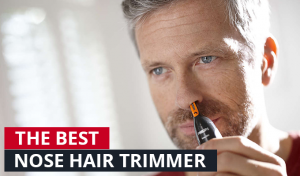 Concerning the disadvantages of the product, some consumers have signaled that the devices do not offer the same performance when encountering a very rich and thick facial hair or when they have to cut the neck-hairs. The weight of the devices, probably caused by the components of the CoolTec technology, has also been criticized by many users, while the Clean&Charge station has been described as “uncomfortable” when it comes to travelling, due to its size. 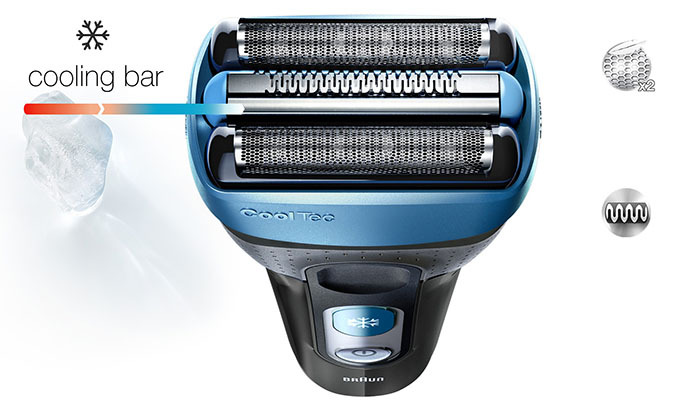 Is Braun CoolTec Shaver Suitable for You? It is certain that if you are in the same line as the men who suffer from a sensitive skin, the devices of this range represent an option that must be taken into account. Also, the performance offered by the main technical features is another important reason, CoolTec being undoubtedly in the top of Braun electric shavers. If besides the sensitive skin you also have rich and thick facial hair, a suitable alternative would be as well the Braun Series 7 shavers. When it comes to recommending one of the five CoolTec electric shavers, my personal opinion and preferences guide me to Braun CoolTec shaver CT5CC model because of the Clean&Charge station. Its price is higher than the other model’s but the auto-cleaning station will save you from the efforts of cleaning and preserving the device. 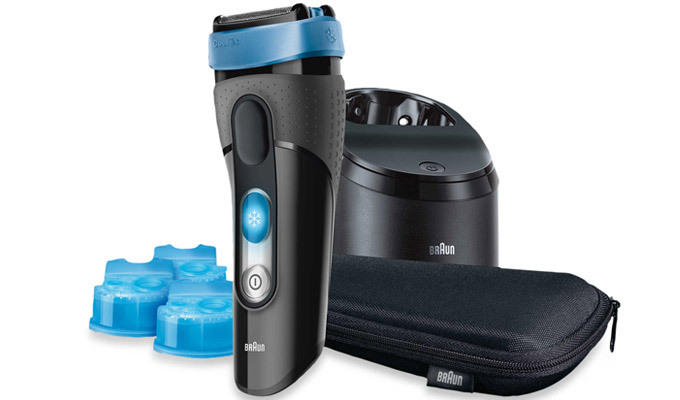 Do you own or have you ever used a Braun CoolTec shaver? We invite you to share your opinion with us in the comment section below.